Here's the shell edging someone suggested. It's nice, but it feels very heavy here. 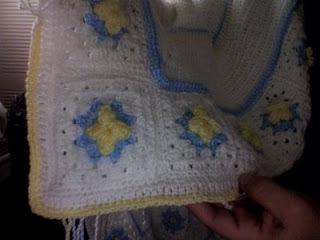 The yellow and blue double crochet edging. 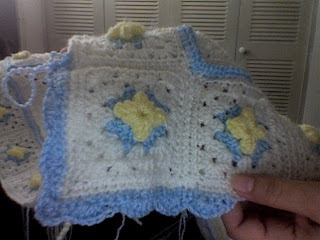 I'm thinking of adding perhaps a white double crochet edge, and then something with color, too. I won't post that here, though. Please leave a comment so I can have them all in the same place and see what you all are thinking. Some people have already emailed their favorite edging, too, with comments. You are all very helpful... ¡Thanks! Totally the yellow and blue - that really completes it! My computer is so S-L-O-W today. One would think I was still using the old telephone connection instead of the supposedly high speed connection. I say all that to let you know that I have paid a visit to your site and the pictures are coming in just a tiny bit at a time. It is going to take a long time to see all your pretties. I plan on bookmarking you so that I can visit you again. 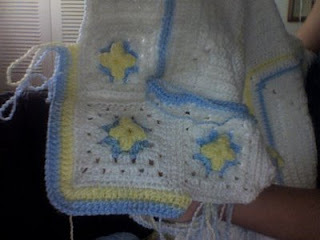 While I think they all are pretty, I like the yellow with blue single crochet border the best.